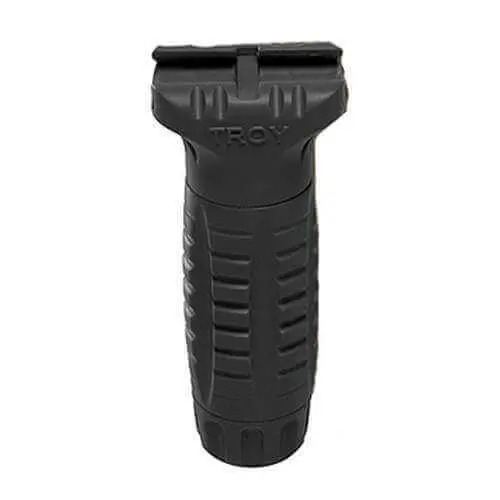 Troy’s modular vertical combat grip features a lightweight polymer design, waterproof storage compartment, and aggressive ridged pattern for enhanced grip. Made from advanced proprietary polymer that is chemical, biological, and impact resistant, the CQB Vertical Grip can withstand harsh environments and rapidly changing mission conditions. Compatible with any MIL-SPEC M1913 Picatinny rail system. Patent Pending. Made in the U.S.A. I really like this grip. Not too long or short. Excellent texture, storage, very secure on rail, good price. Easyou to move around to different spots on the rail by just unscrewing it. It also has a nice storage space inside that's o-ring sealed big enough for 2 123a batteries. Great grip for the price. Plus being a polymer grip it's very lightweight and very well built! I like the attachment method and quality of the grip. Will buy another for my other rifle. I like that no tools are required for installation or adjustment. It has an O-ring sealed chamber that will hold two CR123A batteries. Being made of polymer material, it doesn't get hot during extended shooting sessions. I'm using it on a black Mako AR15 Polymer 3-Rail Handguard FGR-3-B so the forend is not too heavy.